Mt. Beautiful lies in the heart of North Canterbury, on the South Island of New Zealand. The Kaikoura Seaward Mountains lie to the North, while the Waiau River borders us to the North as well. The vineyard rests under its namesake, Mt. Beautiful. Mt. Beautiful crowns the coastal range to the East, and protects the vineyards from the ocean winds. 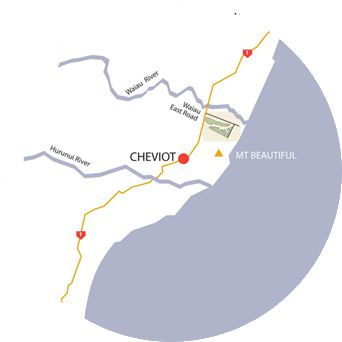 Located about an hour and a half north of Christchurch on state highway 1, Mt. 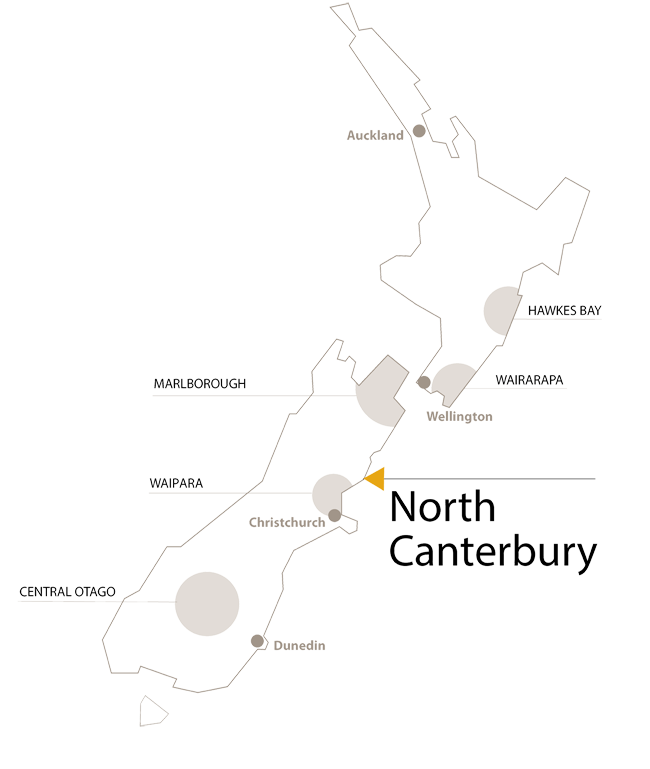 Beautiful Wines is on the Northern fringe of the North Canterbury growing region. Lauded by many critics as New Zealand's most underestimated wine region, it's a place that has begun to get some incredible recognition. "North Canterbury is the centre of 'the finest Pinot Noir' in the southern hemisphere – according to wine critic Matthew Jukes," as quoted in Decanter Magazine. Mt. Beautiful's wines are a stunning representation of the splendor of the region. The Sauvignon Blanc reaches through the herbaceous spectrum to carry flavors of tropical fruits; the Riesling is ripe with mandarin and citrus; the Pinot Gris is lush and exhibits a creamy mid palate; and the Pinot Noir is soft, juicy, and inviting with a hint of cherry. Climate: Cool maritime climate characterised by hot summers with Nor west winds and cooler winters. The planted clones are a mix of University of California Davis (UCD) 1 and Mass selection (MS) on a mix of 101-14, 3309 and Schwarzmann rootstock, with a quarter of the vines Bordeaux clones BDX 316 and BDX 317, on Riparia Gloire rootstock. The Bordeaux clones tend to give a definite lift to Sauvignon Blanc flavors, with less cut grass and more tropical flavours providing a more artisan style, balanced, elegant wine which compliments a range of foods. The Pinot Noir is planted on the Southern section, which has the highest elevation in the vineyard, providing extra warmth and less exposure to frost. In addition to this our Pinot Noir is closely planted to reduce vigor resulting in lower crop levels, allowing us to ripen these grapes to achieve a true expression of this variety. Our Pinot Noir is all hand tended throughout the season and at harvest. Our mix of Pinot Noir clones were specifically chosen for their flavor profile with 50% of the vineyard planted in Burgundy clones. Clone BDX 667 fills out the middle palate, while BDX 777 provides a long finish. The rest of the vines are a mixture of seven other clones, including UCD 5, UCD 6, 114 and 115. The aim of these selections is to build sound palate structure in the wine, providing a vibrant ruby wine with ripe fruit, subtle tannins, great length and persistence of flavor. The Pinot Gris is planted on the warm slopes of a north facing hill block of natural un- contoured land, sloping from 55m to 32m above sea level. This site is well suited for Pinot Gris as it is out of the cooler & lower surrounding areas and the soil mix of silt loam and clay provide excellent water holding properties. It is all hand tended throughout the season and at harvest. A variety of Pinot Gris clones have been planted including, German Geisenheim clone 2/21, new clonal reselections from South Africa, e.g. clones 7a, 14a and 52b and the Berrysmith clone, which provides a full bodied, textural wine with a richness in the mid palate. The Riesling is planted on the higher elevated Southern section of the vineyard bordered by gullies, with the gully to the west being an established pine forest creating a warm sheltered block. The Riesling is closely planted, and has been split into two blocks with the lower block being spur pruned and the higher larger block single cane pruned to reduce vigour and maximise flavour. Like several of our other blocks we tend and harvest this block by hand. These plantings focus on German Geisenheim clone Gm 239, backed by clones Gm 198 and then Gm 110, which provide a classically elegant wine with mandarin, lime and lemon flavors. With aromatics of ripe apple, stone fruits, and nectarines, our Chardonnay has a creamy texture that makes it easy to drink. Medium bodied with underlying notes of buttered brioche and nectarine confit, it finishes clean and crisp with a lovely persistent flint like minerality. Our Chardonnay is planted on the most Northern part of the vineyard and is hand-tended and hand-harvested. The clones are a mixture of French clones B 95 and 2/23 grafted onto rootstock. The vineyardis in charge of dictating the flavour profile of the Chardonnay, so far yielding flavours of peachy stone fruits and creamy almonds. The first vintage was 2013. Two years of diligent research unearthed the plots of land that would be woven together to become Mt. Beautiful—and this patient search was well worth the effort. A world renowned business intellectual and proud New Zealand native, David Teece and his American wife, Leigh, were on a mission to find a place—yet untouched by vines and “off the radar” of the wine industry—that possessed unique characteristics unlike any other vineyard site in New Zealand. Their purpose? 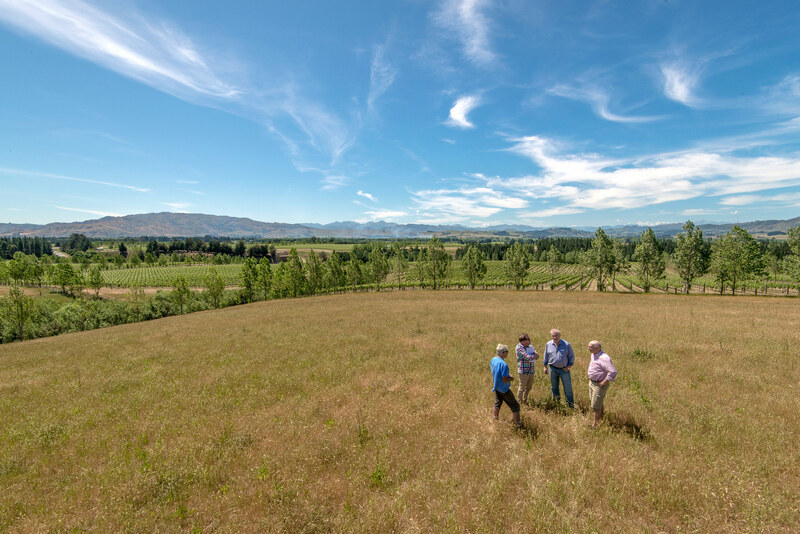 To pioneer an undiscovered region and in the process build a winery that could serve as an inspiring global ambassador for New Zealand’s beauty and the quality of its products. 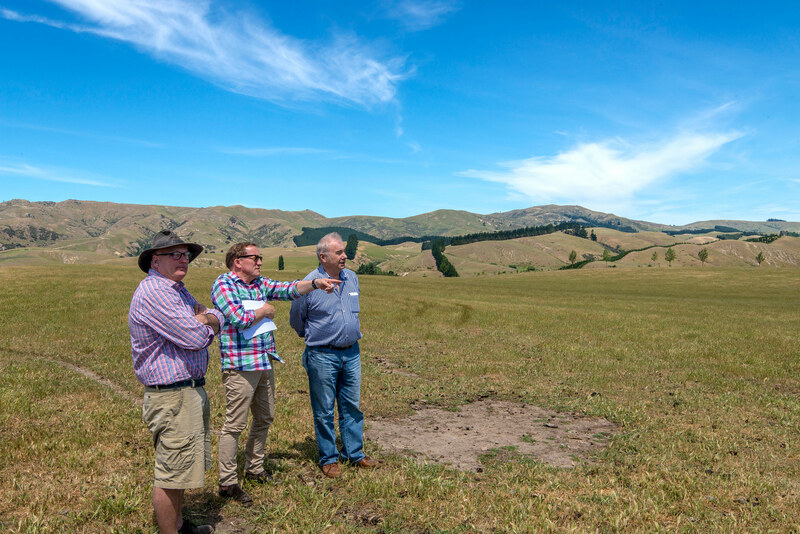 What David and Leigh discovered was a hardscrabble piece of land in the South Island's North Canterbury region, located at the base of the Southern Alps, with the Seaward Kaikoura Range to the North and the Pacific Ocean seven miles to the East. It was in this very spot that William "Ready Money" Robinson bought a massive parcel, called "The Cheviot Estate," with a bag full of cash in 1856. This unusual exchange became known as the largest and most spectacular transaction of the kind ever undertaken in New Zealand. In 1893, however, the New Zealand government stepped in to divide this huge plot into smaller plots, which they sold off to encourage more small family farms in the region. The history of this singular location, and the desire to reconnect formerly disconnected parcels, might have been enough to inspire David and Leigh to transform the land into vineyards. But this rugged outpost, with impressive views of the snow-covered Southern Alps also promised to be a thrilling vineyard site. Embracing the adventure, David and Leigh purchased four farms between 2003-2004 and planted them to vines from 2003-2005. There were risks in putting down stakes in an untested parcel but the "knowns" were risky, too: powerful nor'westers that blow through unexpectedly (and stay for weeks at a time), scorching summers (with very little rainfall, if any) and winter frosts. It's a coarse and weather-beaten patch highlighted by deep chasms, flat spaces, slopes and hills—the kind of landscape that attracts pioneering types (now counting a globally-recognized economist among them). But the risks have paid off in spades. Discovering 23 different soil types was just the beginning. Mt. Beautiful had other advantages: an array of diverse microclimates ideal for planting a range of varietals; the 1392-foot Mt. 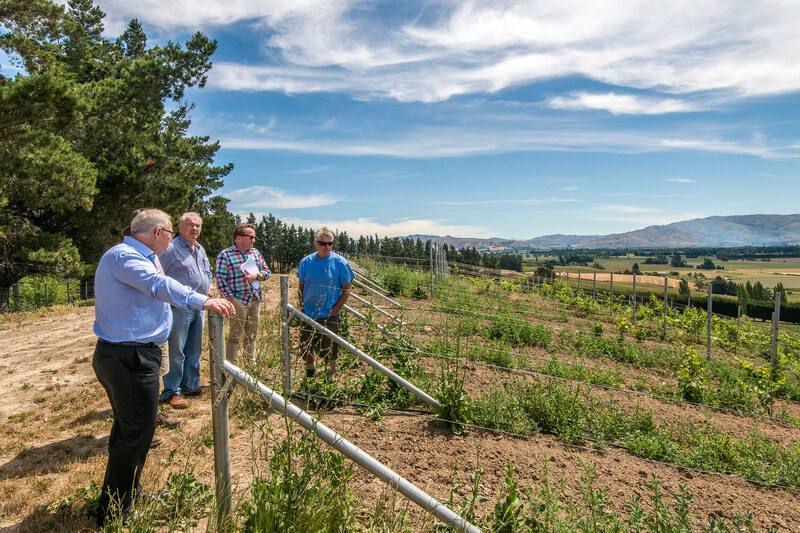 Beautiful, which protects vines from blasts of seaward winds; and the temperature-balancing influences of two rivers, the Waiau (North) and Hurunui (South). The property features Phoebe soils: very deep, well-drained soils formed in glacial outwash mixed with volcanic ash and loess. In their research of every inch of the land, the team has also located a preponderance of limestone. Those looking to craft memorable Pinot Noir believe this is the holy grail of soil, known for its role in producing the great Burgundian wines. The benefits of having different clones of a particular grape varietal are many, ranging from flavor, color, bunch size, and berry size to tannins, phenolics, ability to grow and ripen, and susceptibility to diseases, drought, and frost. In consideration of the diverse microclimates and soil profiles of the vineyard, the team approached clone selection carefully. Today the vineyard features almost 30 selections with six in Pinot Gris, three in Chardonnay, four in Riesling, four in Sauvignon Blanc and over 10 clonal selections in just Pinot Noir plantings. Although Mt. Beautiful’s Sauvignon Blanc is its highest production wine (approximately 15,000 cases per year), the total Sauvignon Blanc volume produced from the Canterbury winegrowing region as a whole amounts to only 2% of that produced by its more renowned Marlborough neighbor. One of Mt. 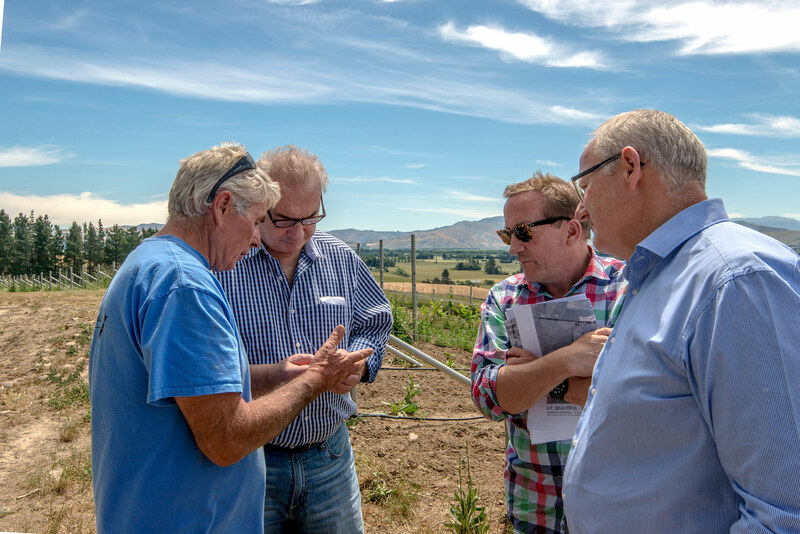 Beautiful’s commitments to developing North Canterbury as a respected winegrowing region is to produce wines that are distinctive from those produced in Marlborough. In doing so, they have planted a mix of clones that tend to give a definite lift to Sauvignon Blanc, with less cut grass and more tropical flavors providing a more artisan style, balanced, and elegant wine which compliments a range of foods. In addition to distinguishing their Sauvignon Blanc, the team at Mt. Beautiful is seizing the opportunity to create a unique flavor profile for their Pinot Noir, since there is no "New Zealand style" expectation for the variety. This also happens to be the second most heavily planted variety in the vineyard, representing 22 hectares (54.3 acres) and more than 90,000 vines. The Pinot Noir plantings feature a mix of clones specifically chosen for their flavor, with 50% of the vineyard planted in Burgundy clones. The aim of these selections is to build sound palate structure, providing a vibrant ruby-hued wine with ripe fruit, subtle tannins, great length and persistence of flavor. With diverse growing conditions, highly coveted soil, meticulously nurtured vineyard and a brand new winery, Mt. Beautiful has embarked on a path many winemakers could only dream of. The result? Certified-sustainable, estate-grown wines that are the expression of this wild and rugged region, with distinctively restrained aromatic and flavor profiles that let the pure terroir come through. The plantings are divided into 22 separate blocks, highlighting clonal selection, sun exposure, land aspect and soil composites. Surrounding the vineyard is our working sheep and beef farm covering 500 hectares. The two main hill slopes are dissected by a lake which divides the vineyard into North and South blocks. The Northern blocks are lower and cooler and more suited to our Sauvignon Blanc. 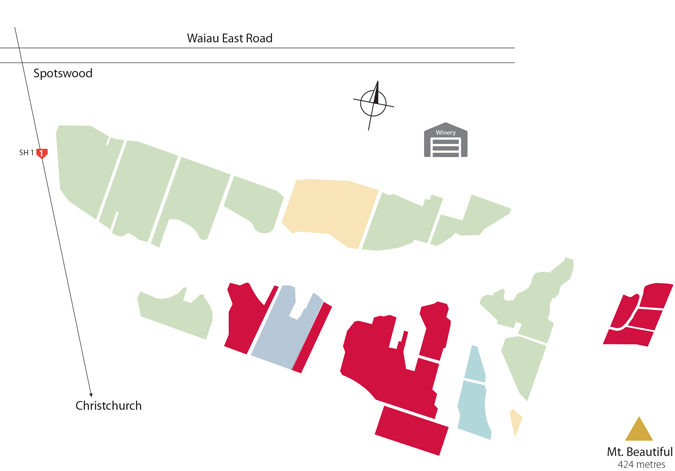 The Southern blocks are higher and warmer, and suited to our Pinot Noir, Pinot Gris and Riesling varieties. The vineyard enjoys a cool maritime climate. Cool nights and warm days, accompanied by north-westerly winds in the spring, combine with the mix of rich silt loam and clay soil to provide an ideal environment for nurturing our vines. We planted our first vines in 2004 and harvested our first grapes in 2007. By working with sustainable practices, we are working in harmony with the landscape and preserving the land for future generations. Our terroir is referred to as Phoebe soils. Phoebe soils are silt loam and light clay on top of a mudstone foundation which is covered by alluvial gravel.